The queen herself makes mistakes sometimes too and it's super cute when she realizes she accidentally sang the wrong lyrics. But of course, that's why her fans love her, her quirkiness and sweet smile make up for any mistake she can possibly make. Being a KPOP idol is tough in that they need to learn Japanese and English to appeal to a wider audience. But sometimes they mess up the lyrics and sing in the wrong language! Charismatic but not at all slick. When Song Min Ho forgets the lyrics to one of their famous songs "Different," he tries to run it through and almost gets away until his keen leader notices and calls him out. Poor Mino! Everyone's special angel Jonghyun still makes his own mistakes. And yet we will still remember and love him for that and his goofy personality and mishaps. 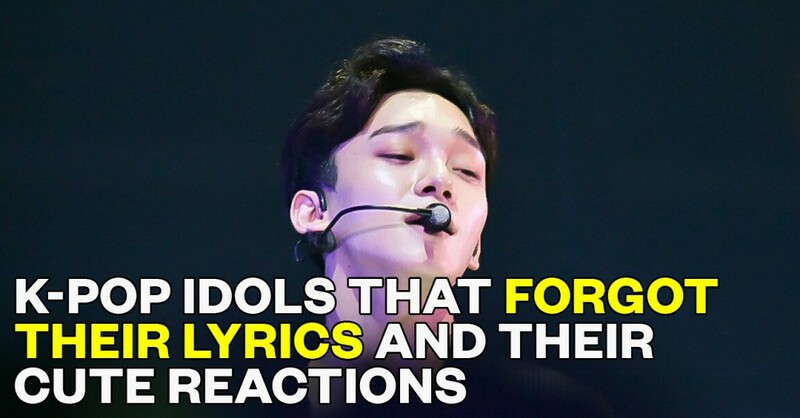 The sweet leader loves nothing more than his fans and his boys and sometimes he gets so entranced he forgets the music he spent so many years working towards. And it is by far one of the cutest on stage clumsiness of our beloved leader. Another fan interference but obviously it shows how much idols love their fans when they can so easily be distracted by the slightest bit of love from their fans. Rapping is hard and sometimes when you stumble over your words there's nothing you can do except stare at your bandmates in hopes for some type of help. But nonetheless, Irene is loved dearly by her fans.